Avila, who turns 27 Wednesday, said his perspective on concussions has changed since he first came into the league. DETROIT — Some call Alex Avila "Titanium Catcher," but the truth is, he’s not as invincible as he would like to be. Last season, Avila took a foul tip off his mask in Cleveland on Aug. 8. Initial tests didn’t show a concussion, so he played Aug. 10 in New York. Avila then experienced headaches and nausea and went on the 7-day disabled list with a concussion. He ended up missing more than two weeks. New Tigers manager Brad Ausmus is a former catcher and understands the demands of the position. He’s made it clear to Avila that he wants the truth about his health. 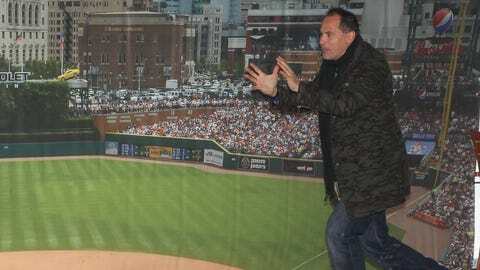 Omar Vizquel has a chance to have a huge impact on the Tigers because he already has the respect of the players. "I actually did talk to him about this the other day," Ausmus said during TigerFest. "We have to make sure because the one thing I get concerned about — and I learned this in San Diego with Nick Hundley because he had some concussions — is that a lot of times, these guys won’t tell you. "He’s got to be honest with us. If he gets a foul tip and he’s fuzzy, we need to know because we’d rather remove him for a week instead of losing him for two months." Avila, who turns 27 Wednesday, said his perspective has changed since he first came into the league. "I guess I’ve had to put down my stubbornness a little bit, especially last year," Avila said. "There’s a lot of things now that I know what to look for, as far as if there are signs of concussions and things like that. "But I’m hoping that I won’t have any more issues with that. I hope that’ll be the case. But if something does happen, trust me, I’ve learned enough about it now that I have to say something. "As much as I want to be out there, I’m going to do whatever I can to stay out there as long as I’m healthy." Although Avila has had just one official concussion, he realizes there might have been more that weren’t diagnosed. "I may have had some in the past that you never notice," Avila said. "But especially last year, there were a lot of catchers that went on the DL for concussions, I think because we’re more aware. We know what to look for now as far as symptoms. "Guys aren’t afraid to speak up about it just because of what we know now." One thing Avila did do after he returned from the disabled list was start wearing a heavier mask to absorb more of the impact from the foul tips he seems to get so frequently. 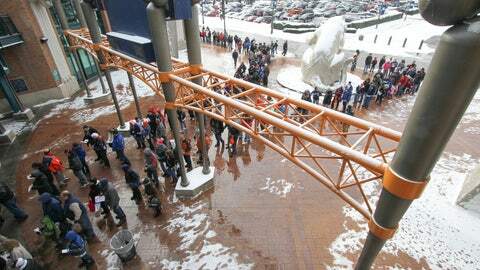 Tigers fans didn't let a little swirling snow and freezing temperatures prevent them from attending a sold-out TigerFest at Comerica Park. "The new mask seemed to work pretty well," Avila said. "I didn’t have any more issues after that. Hopefully, that continues." Another thing that could help Avila stay healthy is the proposed rule to ban home-plate collisions. The rule has yet to be finalized, but it’s expected to be in place in time for the upcoming season. "I’ve been for it when I’ve been asked about it," Avila said. "It’s something that could prolong my career. It’s hard not to be for something if it can help you out." San Francisco Giants catcher Buster Posey suffered a broken leg in a 2011 collision, which first prompted discussion of such a rule. St. Louis manager Mike Matheny, a former catcher, had to retire because of post-concussion syndrome. Avila doesn’t believe the rule will change the game significantly. "There’s not that many collisions at the plate over the course of a season," Avila said. "The thing is, they’re violent because you have a runner coming at you full speed and you’re just standing still. "The few collisions that there have been, there have been some serious injuries. So basically, if there’s so few, why (not) have it in place anyway." Avila said he’s been on both sides of such collisions. "I’ve been a runner going into a catcher; I’ve been hit as a catcher" he said. "I’ve been the first to tell people I have no problem with it. "But now that people are talking about changing it, it’s hard not to be in favor of something that could not only help me during my career but after my career." The most memorable collision Avila had was in April 2010 in Seattle, when Eric Byrnes crashed into him. "There was a picture, I think in Sports Illustrated, after that happened," Avila said. "He’s completely just Superman in mid-air, and my eyes rolled up, the mask, everything flying off, glasses flying off. "All you see from him, he’s stretched out like Superman with his arms out. It’s a pretty cool picture. "I never dropped the ball though. He was out." Avila has already demonstrated how tough he is. Now he just has to balance that with keeping his brain healthy.